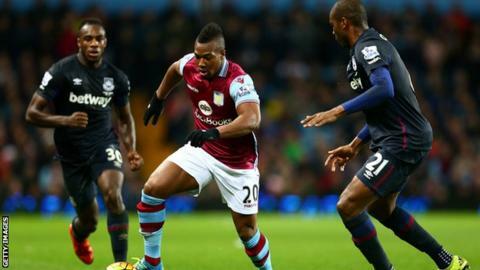 Aston Villa winger Adama Traore has been ruled out for up to 10 weeks after breaking a bone in his right foot. Traore, 19, went off in Saturday's 3-1 defeat by Sunderland after providing the assist for Carles Gil's goal. The Spaniard, who has been asked to play for Mali, joined Villa from Barcelona for £7m in the summer and has made 10 appearances, scoring one goal. Villa are bottom of the table, 11 points from safety, having won just one of their 20 Premier League games. Manager Remi Garde said last weekend's defeat had made the club less "attractive" to potential January signings, but said some targets are "still very motivated to join". He added: "The group has been suffering for a long time now, since the beginning of the season. We need fresh players to regenerate this group. Sometimes the spark needs to come from outside. Hopefully this is what will happen in the transfer window." Reports this week in the national press have suggested the club is already planning for relegation to the Championship by instructing scouts to recommend players who will get Villa promoted back to the top flight. "No, I am planning for the next game. I just try to work hard on this transfer window to attract players that could help us to win the next game, not the next league. "Sometimes there are a lot of players in other countries that want to play in England. Some want to play for me because I know them. But of course the situation in the last weeks has not played in Aston Villa's favour. "If I can attract the first one, maybe the others will follow. I think when you are a good player it shouldn't take you so long to settle in."